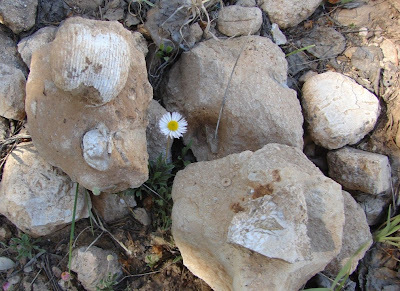 Andrew Alden over at About.com Geology asks an interesting question: What was your first fossil? 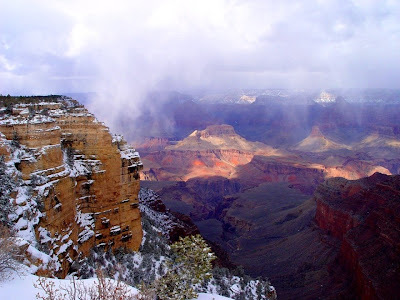 It took only a split second to take me back forty years to the North Rim of the Grand Canyon, where a 10 year old boy was on his first trip to the beautiful national park. But I had found out something strange at the small visitor center there. The ground I was walking on at more than 8,000 feet had once been on the bottom of the sea! Say what? How could that be? I was already at an age where I had figured out that Noah's Flood couldn't account for this. Where was all the water that it could even cover Mt. Everest and all the other mountains of the world? It was clear that something had happened, but I wasn't quite in a place where I could understand the idea of vast uplift across an entire region. I spent days musing about this, enough that the memory is clear after all these years. After a few days camping and hiking around the rim (it would be quite some time before I would actually walk into the canyon, an event that caused me to become a geology major) we set out to see more sights in the region, but as we left the park, we drove through the long stretch of highway to Jacob Lake that passed through a beautiful forest and meadowland. We stopped for a few minutes and wandered into the meadow, and looking down I saw some little miniature poker chips, and realized that these were some of the ocean floor fossils I had seen pictures of in the visitor center! They were pieces of the stems of a crinoid, or sea lily, and after a few moments of searching, I had found a fossil sponge as well. It was a seminal moment that I can count as leading directly to my choice to pursue geology as a career, and one of the great moments of my childhood. I really have to thank my folks for taking me on so many wonderful excursions when I was growing up. Life was such an adventure during my father's ever-so-brief two week vacation. The pictures above: a view from the North Rim of the Grand Canyon, the less crowded, more verdant part of the canyon, a view of one of the numerous karst meadows north of the rim, and a sampling of some brachiopods, crinoids and sponges found in the Permian Kaibab Formation. The Cenozoic Era was a time of great change in the Colorado Plateau area. Mountains rose to great heights around the margins, especially in the Rockies, and rivers carried vast amounts of sediments across the region. But the rapid warping of the crust disrupted the flow patterns of the rivers, and some ended in vast lakes that covered large parts of Utah and Wyoming. In many areas all the Cenozoic sedimentary rocks were stripped away, but in some choice locations the lake sediments were preserved. 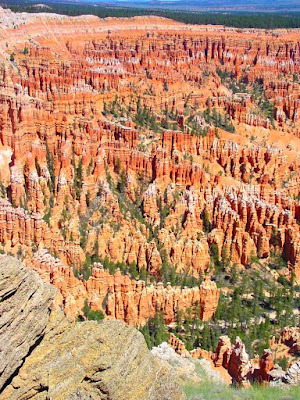 These rocks form the bedrock of two truly unique parks on the plateau: the world-renowned Bryce Canyon National Park, and the much less-known Cedar Breaks National Monument (Ah-ha! You thought the top picture was Bryce Canyon, didn't you? It's not). Lake sediments are usually clay-rich and very soft and unresistant to erosion, so they rarely form cliffs unless they are protected by some kind of hard caprock. The Claron or Wasatch formations that make up the cliffs of the two parks include freshwater limestone which is a great deal more resistant to erosion. The rocks have been fractured by pressure from nearby faults, and vertical cracks (joints) have allowed erosion to form the unique towers of stone called hoodoos. Oxidation of iron bearing minerals in the rock led to the intense red color that dominates the attention of the observer. Fossils are rare in these rocks, but we know from other related rocks on the plateau that a few tens of millions of years after the great extinction event that ended the reign of the dinosaurs, the survivors had evolved into a rich ecosystem that included birds, mammals, reptiles, amphibians and fish. Insects are even occasionally found as fossils in the rocks. The mammals, which emerged from the Cretaceous extinction as small rat-sized insectivores diverged into all manner of carnivores, large grazing animals, and smaller forest browsers. The biggest plant-eaters were almost dinosaurian in bulk, and some of the carnivores as intimidating as any raptor. And yet, this was a world that was coming to resemble something more familiar to us in the present day. We might not have any more of the giant browsers on this continent, but similar animals survive (barely) on the African continent. And the tigers and lions and hyenas, although a bit smaller than their ancestors, are still as capable as any of these carnivores of the geologically recent past. Bryce Canyon National Park is well known, making part of a recreational triangle that includes Zion and the North Rim of the Grand Canyon (and which now includes Grand Staircase - Escalante National Monument). Roads traverse the tops of the cliffs from one end of the park to the other, and a series of rather spectacular trails wind among the hoodoos. Elevations range up to 8,000 feet or so. Cedar Breaks lies to the northwest, at the edge of the Wasatch Mountains overlooking the town of Cedar City and the barren mountains and desert flats of the Basin and Range province. It sits several thousand feet higher than Bryce Canyon, so roads may be closed by snow well into May. 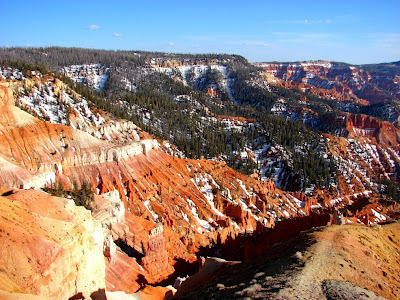 If the hoodoos at the Breaks are maybe less in stature than those at Bryce, they also tend to be more colorful, and the forest and snow banks provide beautiful contrasts that are not often visible to the casual tourists who visit Bryce in droves. The end of the story approaches! A project I thought would last a month or so has stretched into an entire year. Still to come: an explosion of volcanism sweeps across the region! I'm almost embarrassed to come back to this subject, but I have always had an unfortunate propensity to leave big projects unfinished and I would like to overcome it. I was also inspired by the reemergence of the Accretionary Wedge after a brief absence, and some of the final posts in this series will involve the newest theme of the Wedge for June. 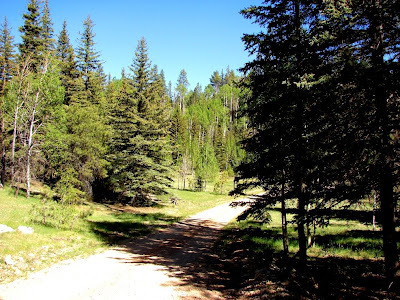 The subject of my blog is the geologic history of the Colorado Plateau, and it has been a theme of my blogs since last July, although posts have been sporadic of late. Check here to get caught up. My last post concerned the disaster that met the animals of the region at the end of the Mesozoic era. This post will seem similar, but now we are looking forward to the new world that was left to the survivors at the end of the age. The Colorado Plateau of the early Cenozoic was a new and unique landscape, unlike anything that had passed before. Somewhat like the last post, it brings to mind another poetic passage in the Bible, from Isaiah: "For behold, I create new heavens and a new earth; And the former things will not be remembered or come to mind." The oceans, which for many eons had washed over the region in a series of transgressions and regressions, had receded far to the west and south, and never again would lay down sediments on the Plateau. The crust had been buckled by regional compression which reactivated ancient faults in the deep crust and forced the rocks into a series of structural domes and basins. This event, the Laramide Orogeny, is what raised the Rocky Mountains, and formed the broad outlines of sub-provinces of the Colorado Plateau that we see today. The edge of one of the uplifted domes is seen as the Cockscomb Monocline in Grand Staircase/Escalante National Monument. 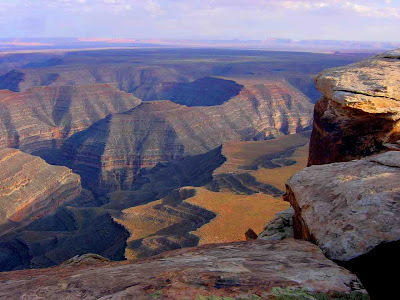 Farther north, the buckled rocks form the eastern edge of the Kaibab Plateau that is bisected by the Grand Canyon. Rivers were established across the landscape, and some ended up with nowhere to go, forming vast lakes in what is now Utah, and Wyoming. Volcanism swept across the region as well. But more than anything else, the region was now far above sea level, so in most areas it was eroding, and rocks that had been laid down over the previous 2 billion years were now being stripped away and being carried to the sea. For the geologists of today, it meant that the evidence of the past was disappearing, and in many respects, the Cenozoic Era is one of the most cryptic time periods for us to decipher. Compared to Paleozoic and Mesozoic time, Cenozoic rocks are fairly rare on the Plateau, and thus little evidence remains to tell us what happened, or who was living here. And that is the other part of the story...the ecosystem of the region, and indeed the entire planet had been decimated by...something. The iconic dinosaurs were gone, and many large denizens of the oceans had disappeared as well. The land-based ecosystems in the earliest part of the Cenozoic were depleted, especially of larger animals. The mammals, who for whatever reason had survived the extinction event, vied with the birds for dominance. The birds almost won! Some species of the avian clan were large flightless predators that would have done their dinosaurian ancestors proud. But by and by, the birds retreated to the environmental niche they were best adapted for, the trees and skies, and mammal-based ecosystems were established in forests and grasslands throughout the world. Posts coming soon on the Cenozoic's unique national park on the plateau, and the evidence of volcanism in the region. And...where the heck did the Grand Canyon come from? I was graduating from college on the very day the volcano collapsed and exploded. We've referred to our graduating class as the St. Helenians to this day. It was a true tragedy, but geologists have learned so much from the eruption sequence that many thousands of people are alive today because of improved volcano monitoring methods and increased knowledge. 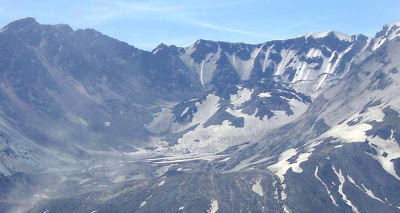 St. Helens has been an excellent outdoor laboratory for my students over the years, and the pictures above show one of the reasons: the volcano is a dynamic geologic environment on a human time scale. The 2004-2008 eruption produced a new dome in the crater of the volcano that is taller than the 1986 dome, and there is no reason to think that the volcano is done yet. Now that the Glacier Point Road is open, Yosemite National Park visitors have an opportunity to get a true bird's-eye view of the Ahwiyah Point rock fall that took place in late March of this year. This was an event that changed the look of Yosemite Valley forever, and drives home the point of the rate of geologic change, even on a human time scale. Many thanks to Doug Nelson, photographer of the image of the slide, taken a few days ago. 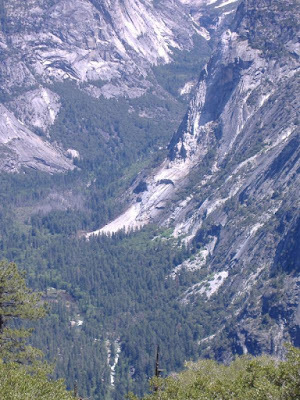 The top photo was from a 2005 visit to Glacier Point by my field studies class. A "miss"-adventure: missing the chance to see something important by mis-scheduling, missing a turnoff, getting rained or snowed out. One more story explains the lack of blogging for a bit. We got 35 students together a year in advance, got several thousand dollars of non-refundable deposits, paid the company and looked forward to our adventure. The trip material arrived a few months later, and...presto! Uluru was gone from the schedule, with no explanation. The company barely had e-mail, and an explanation was days in coming, having to do with airlines changing their schedules and bureaucratic difficulties and would you like a few days in Fiji instead? So, non-refundable deposits have a reason. Sucker that I am, we continued on the trip, and despite many management problems from the lousy company, our students had a good time, and we did see a lot. But who knows when or if I will ever have a chance to see the Olga Rocks and Uluru? What's the moral? If you want to see everything you want to see on an overseas field trip, well, you have to plan and conduct it yourself. Thus, the spotty blogging. I'm leaving on a field trip in a few weeks to the Hawaiian Islands (three of them), and I am running the trip myself, with the help of some gracious volunteers. It's a lot more work, but it will be a great deal cheaper, and we will be able to see everything that is great about the island's geology. Interested in Teaching Earth Science/Geology in California? 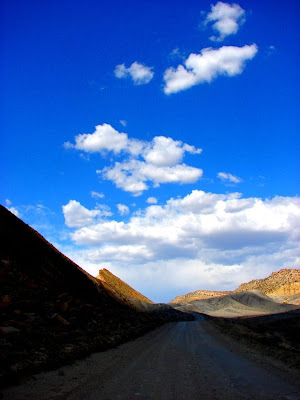 I've posted the current teaching opportunities in the California Community College system over at my blog for the Far West Section of the National Association of Geoscience Teachers, Teaching the Earth Sciences. Forgive me for shamelessly plugging the site every so often: It doesn't get a lot of traffic, but I think it has great deal of useful information available on teaching and geo-touring in the California-Nevada-Hawaii region. They sell an excellent selection of guidebooks, with the proceeds going to a scholarship fund for earth science students in the region. Please also catch this important post on the need for support for a change in attitude by the University of California towards the earth sciences in their admission requirements. Earth Science has always taken a back seat to chemistry and physics, and yet is most vivid example of chemistry and physics at work in the real world. We need to support the teaching of the earth sciences at the secondary level. 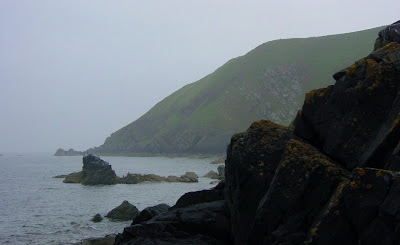 The very first international field trip I led was to Scotland in 2001 to see the great geology, but especially to visit some of the famous James Hutton localities. We made special arrangements with the tour company (for a price) to deviate from their usual tour (to St. Andrews to see golf courses), so we could instead head into the southern uplands of Scotland to Siccar Point, site of the famous Hutton/Playfair unconformity* . We committed to the trip 1 1/2 years in advance, having no idea that hoof and mouth disease was about to be detected in the British Isles, including the farms around Siccar Point. So near, so far is so right! Access was impossible. In total frustration, I pulled out the topo maps, and we made our way to a campground about a mile north of Siccar Point. I read the passage from John Playfair to the students, and than I ran as far as I could along the beach cliffs to where I could see the point, but not the relationships (although we could pick up the associated rocks along the coast). The story in pictures is here. On the same trip, we intended to visit the grave of Hutton at a church in Edinburgh, but as luck would have it, the particular section of the cemetery was locked up because of past abuse by the perpetrators of the the "Ghost Walks" in the town (yeah, yeah I did a ghost walk too, tourist that I was). "What clearer evidence could we have had of the different formation of these rocks, and of the long interval which separated their formation, had we actually seen them emerging from the bosom the deep? We felt ourselves necessarily carried back to the time when the schistus on which we stood was yet at the bottom of the sea, and when the sandstone before us was only beginning to be deposited in the shape of sand or mud, from the waters of a superincumbent ocean. An epocha still more remote presented itself, when even the most ancient of these rocks instead of standing upright in vertical beds, lay in horizontal planes at the bottom of the sea, and was not yet disturbed by that immeasurable force which has burst asunder the solid pavement of the globe. Revolutions still more remote appeared in the distance of this extraordinary perspective. The mind seemed to grow giddy by looking so far into the abyss of time...."
The photo is my best shot of Siccar Point, in the far distance of the scene. What are your best "miss-adventures"? A nice little photo "what is it?" for the day. The dark chunks are about a foot across and the location is at the south end of Joshua Tree National Park. I was going through the photo archives of one of my meetings of the National Association of Geoscience Teachers, preparing a post about our roadguide for the geology of the Coachella Valley and surrounding mountains. You can check it out here. Brad Paisley, A True "Rock" Artist? BP: This is a volcanic hot spot in Hawaii. It’s for a TV special I’m writing a soundtrack for. I just can’t explain how the sight of red hot lava bubbling up from the ground — I just find it moving— the earth reforming itself.....continents shifting......earthquakes......I want to learn more and more about geology— have you ever read John McPhee’s book, Rising From The Plains? BP: I just find the science of geology so exciting....so fulfilling— I don’t want to sing about love anymore. I want to sing about the earth. Let other people hang out in bars. I lie on the rocks and look up at the stars. Kudos to Prairie Home Companion! The largest rockfall in Yosemite Valley in two decades thundered off Ahwiyah Point in late March of this year, setting off seismometers in Berkeley, which recorded a magnitude 2.4 quake from the impact. I posted a number of pictures and descriptions at the time. Now the Modesto (and Fresno) Bee has run a front page article detailing some of the research being done on the slide by Berkeley graduate student Valerie Zimmer (details here). It's great to see some good geology on the cover of the local news, especially when they get the general details right. This note was also posted at the other blog I run for the National Association of Geoscience Teachers. 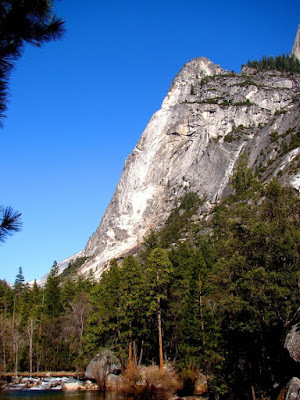 We have some great geology field guides for the California-Nevada region you might want to check out, including a geologic tour of Yosemite Valley. Part of the Yosemite tour is posted at http://virtual.yosemite.cc.ca.us/ghayes/roadside.htm. 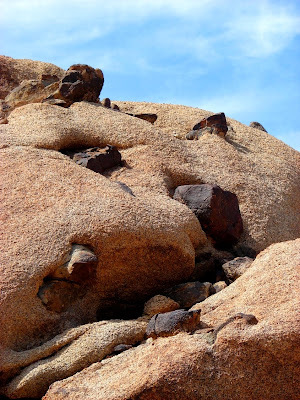 I've been doing field trips to the southwestern United States for darn near a quarter century, enough that there are places out there where I know individual boulders and how they've changed over the years...it's a wonderful, and wondrous place. Regular readers will recall my nearly year-long review of the geology of the region, for instance (and yes, I intend to finish; I only have 65 million years to go out of the original 2 billion). I'm not going there this year. I'm headed overseas to our 50th state with 25 students instead. When I started considering a trip that involved flights and hotels and vehicle rentals, I thought of letting a travel company make the arrangements, but from experience I knew the expenses pile up rapidly and the profit margin demanded by the tour companies makes the cost prohibitive. So I made all the arrangements myself. I have found that holding and spending tens of thousands of dollars of student's money, knowing that if I screw up the trip won't work, well, it's intimidating. You can't really commit to hotel and flight reservations until you know you'll have enough people, but people like to wait to the last minute to commit because they don't know if they'll have the money or the time off, so there is a delicate balancing act. But it is working out well so far. Thank heavens for the wonderful folks who are helping me out! back there at six o'clock?" The photo of the day takes in the view from Cedar Mesa in the Four Corners region. The Cedar Mesa Sandstone is sort of correlative to the Coconino Sandstone that is most famously exposed as the white cliff near the top of the Grand Canyon. Both units date from the late Permian, and represent coastal and desert sand dune environments. The deep canyon in the distance contains the San Juan River. The encised meanders are the famous Goosenecks of the San Juan. Well, ok, it's one of our more cliched geo-jokes, but some kudos are in order for VIA Magazine, the publication of the American Automobile Association. The cover of their May/June 2009 issue features a photo of the Grand Canyon (not the photo above, that one is mine), and a lead article featuring ten of the best geological parks in the United States! The article, by biologist Chris Woolston, is to be commended for including not only the familiar sites like the Grand Canyon and Yosemite National Parks, but also places like Mono Lake in eastern California, Palouse Falls in Washington, and the badlands of Makoshika State Park in eastern Montana. It's nice when geology gets a bit of credit for the scenery! Here's some food for thought: What ten parks would best display the geological history of your country? I'll have to think on that one a bit...I live in a very big country.